Remember the caterpillars from last week? They are no more. They have each turned into a chrysalis. 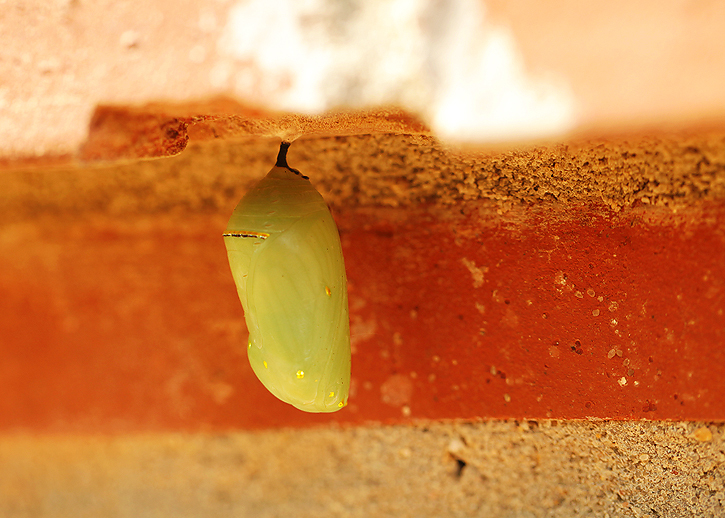 The first two are hanging underneath a brick window ledge and the third is happily becoming a butterfly inside his own little home. First they hung in a J position for a day. 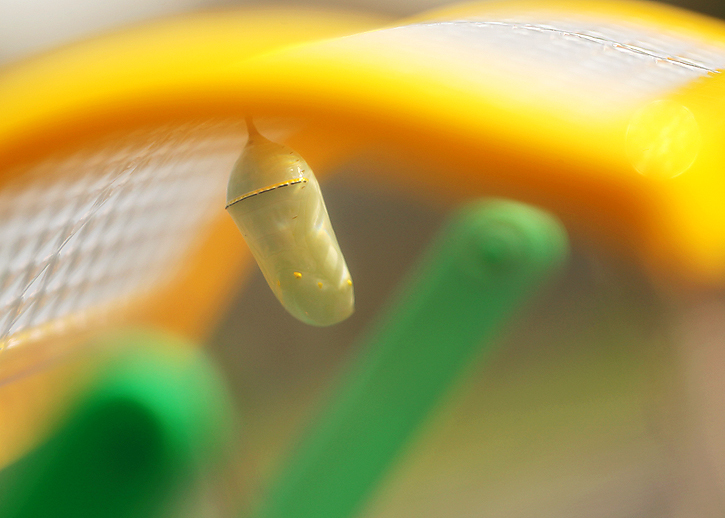 Then the chrysalis started to form, and I mean it happened fast! 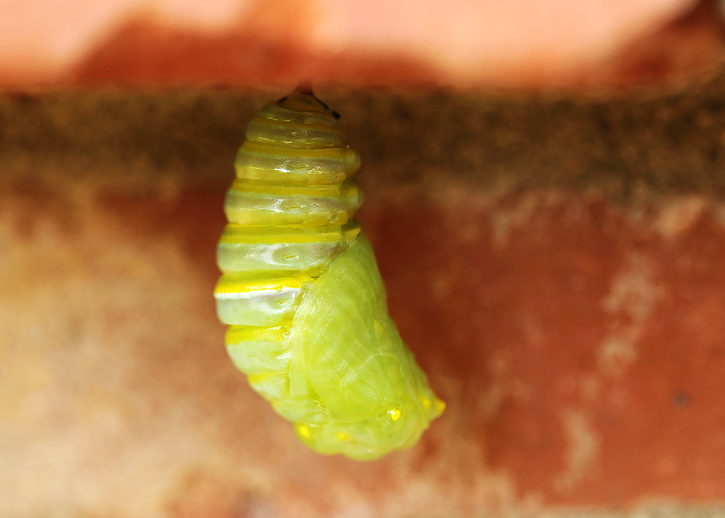 About an hour after I checked and saw the caterpillar still in a J, I went back and found the partially formed chrysalis. And just a little while later, they looked like this. I think they're such a lovely shade of green. Their chrysalides eventually became solid green with a touch of beautiful gold accents. They haven't changed much in the last week. and #3 tucked away in the bug habitat. 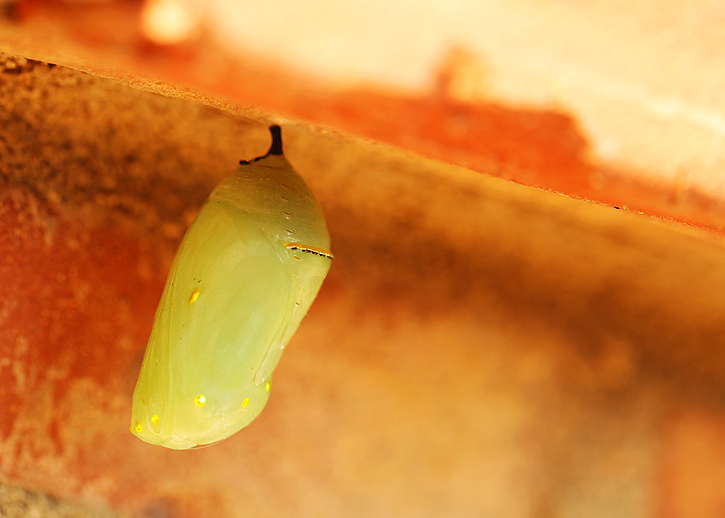 The chrysalides are exquisite just like the monarch butterflies they will become. They look as if someone painted them with a tiny strip and a few dots of pure gold. Here's a closer look. I'm checking on them all throughout each day for changes in hopes that I won't miss #1 and #2 flying away. At least I will have #3 if I miss the other two. It should be any day now! **Update -- I can totally see the monarch's wing through the chrysalis this morning so it looks like today will be the day! I'm posting iphone pics on my instagram feed in real time (username is debduty). I'll post an update on my blog next week! Wow...everything about them is beautiful, huh!? They are so incredibly beautiful, aren't they? Your pictures are gorgeous! I can't wait to see the butterflies! So exciting!!! I remember learning all about this with my class in Sept/Oct as we studied this life cycle - the monarchs are much prettier than the painted lady! The difference between your first and second which happens in hour is amazing. Would be something to be able to sit and watch this process (speeded up). 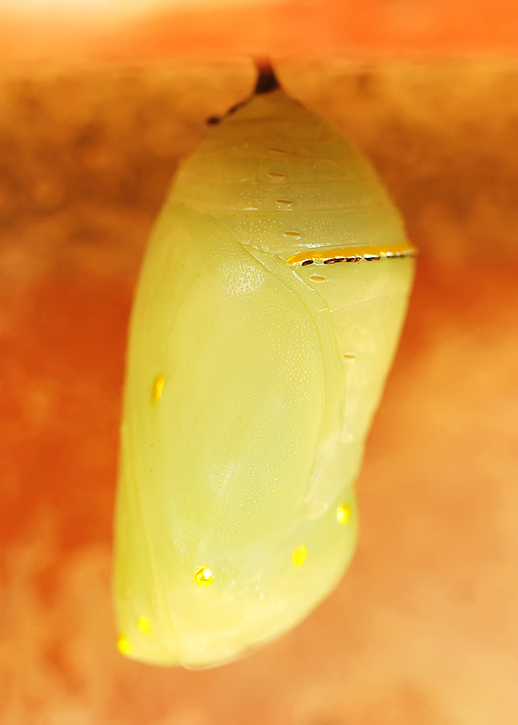 Just checked out the process on YouTube - their outer skin splits and peels off revealing the chrysalis colours underneath - stunning! Stunning shots. Such a wonderful miracle of life. Amazing pictures Deb those are gorgeous I can't wait to see pretty butterflies. It's like we are looking at "The Very Hungry Caterpillar" right on your blog, Deb! ;-) Amazing shots! WOW! Fantastic photos. 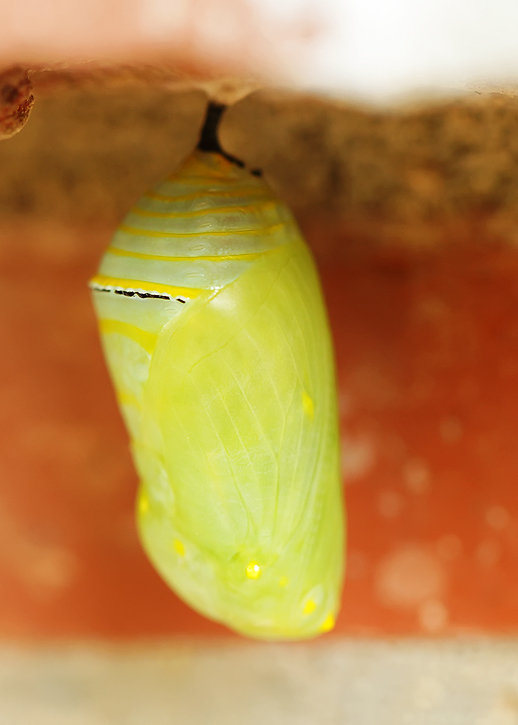 I grow milkweed to attract monarchs and each year am amazed at the gold-studded chrysalis. No matter my age, I never lose the awe! I've seen your prior posts; this is so exciting! And, amazing photos, of course. That is so awesome that you have been able to capture the process. Beautiful shots. Truly MIRACULOUS to watch!! WOW! Can't wait for my kids to get up so I can show them. 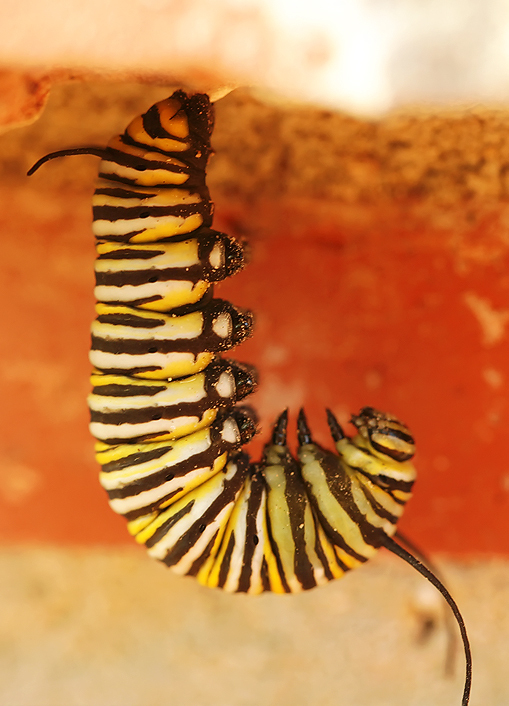 amazing photographic chronicles of caterpillar to butterflyness!! I hope you catch THE moment!! another miracle of nature! VERY COOL DEB! I feel like I am watching a science experiment. You are getting some really great shots of the progress. I can't wait to see the finale! That is so coool. It really does look like paint drops! Seriously cool! I can't wait to see the butterflies! That was interesting. It would be interesting to see whatkind of butterflies they are !!!! Wow your shots are amazing. And how cool for you to witness this, I've never seen anything like this before. It all seems to have happened really quickly too. I can't wait to see your butterfly pictures. Thanks so much for sharing. These shots are awesome... you are very lucky to be getting to watch this amazing feat of nature in person. Truly MAGNIFICENT captures, Deb! LOVE that first one. I've missed you & your beautiful photos!! Amazing detail, Deb! You are right - the chrysalis is gorgeous. Who knew a little temporary house could be so adorned. I love the photos on IG, too - can't wait to see your macro shots of the guys emerging - you'll get something off your photography bucket list! This is incredible, Deb! thank you for sharing it! Completely fascinating! I can't wait to see more. Nature is a beautiful thing! Great images Deb!! I have thoroughly enjoyed watching the progress in Instagram. Isn't nature such an incredible thing to observe??!! Thanks for hosting and sharing the transformation of caterpillar to butterfly. That is just so very cool. I've never seen the whole process before, slim learning a lot here. That is so cool. I have enjoyed seeing them on instagram. I love Butterflys. Such miracles they become . That is SO cool that you managed to capture the different stages! Can't wait to see how things go! Deb, this is spectacular ... can't wait to see them arrive! How fun for you that you have all these pics. Monarchs are just wonderful butterflies, so distinct in their markings. Beautiful captures. So insanely beautiful. I love it. how very exciting! I took the kiddos out hunting for caterpillars on milkweeds last week and we brought home a dozen. Two have died, but the rest are going strong! We just change out the milkweeds every other day. Today I picked a fresh one and it had a ton of eggs underneath a leaf! Wow. So exciting. Going to check your instagram feed right away! Fabulous photos as always Deb. This is so neat that you have captured this! I have never really seen the detail like this before. So cool! These are such great shots; I can't wait to see them become butterflies! I'm totally thinking of The Hungry Caterpillar now! So awesome!